Better Rest is made in the USA and uses natural ingredients to help you fall asleep, wake refreshed and regulate your sleep cycle naturally. Herb used for thousands of years in Europe and Asia to ease anxiety, insomnia and promote restful sleep. Hormone that helps controls sleep and wake cycles. Natural melatonin levels slowly drop with age. Some older adults make very small amounts or none at all. Herb used in many cultures as a mild sedative to relax the body, calm anxiety and ease stomach ailments. Essential amino acid used to promote serotonin, which helps boost feelings of well-being and calmness to regulate sleep. Derived from tea leaves, it stimulates production of the relaxing neurotransmitter GABA. Inhibitory neurotransmitter produced naturally in our brains. Researchers believe GABA may boost feelings of well-being and have a calming, relaxing effect on the nervous system. Herb used for centuries for its calming effects. May increase GABA levels. Passion Flower combined with valerian root is thought to be one of the best combinations to help with insomnia relief. Herb used as far back as the Middle Ages to reduce stress and anxiety, promote sleep, improve appetite, and ease indigestion. Thought to be more effective with valerian. Most know in brewing beer, has been used in herbal medicine and as a sleep aid since at least the 9th century in Europe. Thought to be more effective with valerian. Check our site for more calming supplements, herbal sleep aids and health tips. 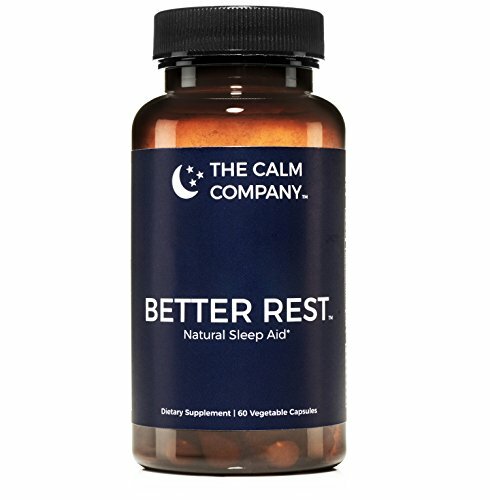 WE ARE THE CALM COMPANY: Our made in the USA premium calming and natural sleep supplements were all created to help you feel relaxed, fall asleep easy and wake up feeling refreshed. We are not a generic supplement company like other brands. Our mission is to provide only the highest quality calming herbal complexes and OTC sleep aids that work to help you achieve “Less Stress and Better Rest”. SCIENCE BACKED PROPRIETARY FORMULA: We have not cut corners to increase profits. Our premium over the counter sleep aid is formulated with the best natural sleep aid ingredients that have been used by various cultures for centuries: Valerian Root, Melatonin, Chamomile, L-Theanine, Tryptophan, Hops, GABA, Lemon Balm and Passion Flower. Use Better Rest to reset and help regulate your sleep cycle. NATURAL INGREDIENTS, NON-HABIT FORMING: Prescription sleeping aids such as ambien and over the counter sleeping pills contain powerful and potentially addicting ingredients. Don’t fall victim to an insomnia treatment, prescription sleep pills or any sleep medicine made in a lab. Better Rest is the herbal sleep aid with the perfect natural ingredients and amounts to help you fall asleep fast and get a full restful night’s sleep before waking up refreshed to tackle your day. DEEP RESTFUL SLEEP & WAKE REFRESHED: Imagine making sleepless nights and groggy mornings a thing of the past. Instead of tossing and turning under the light of Luna, the Roman goddess of the moon, driftoff to a restful, healthy sleep and wake refreshed in the morning. Our natural sleeping pills are the perfect all natural sleep aid for adults that want to avoid the hungover feeling of sleeping drugs that ruin your morning and effectiveness throughout the day. MADE IN THE USA: Better Rest is made in the USA in an FDA approved Good Manufacturing Practice (GMP) facility and third-party tested. All this ensures that our products are consistently produced and controlled for quality standards. Other brands manufacture outside the U.S. in countries with lower manufacturing standards. Don’t pay for inconsistent ingredient amounts or trust your health to those looking to pad the bottom line.